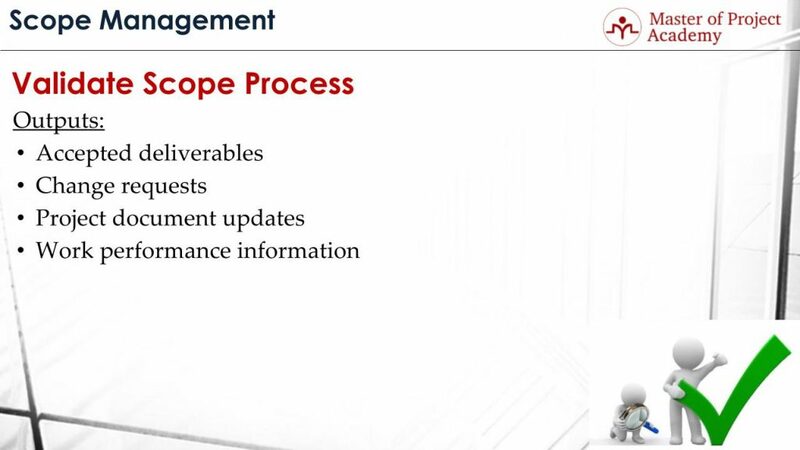 As defined in PMP training courses, the 5th process of the scope management knowledge area is Validate Scope Process. If you are studying for the PMP exam, Scope Management should be an important part of your PMP study plan. 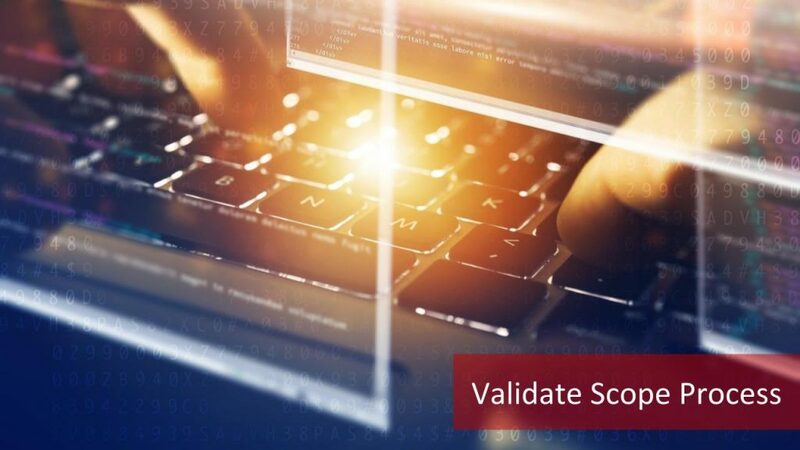 In this article, we are going to have a detailed look into the inputs and outputs of Validate Scope process. We will also explore the benefits of Validate Scope Process and finally, we will summarize the whole Validate Scope Process in five steps. If you like to have a brief introduction to scope management you might also consider enrolling in an online free PMP training. What is Validate Scope Process? Validate scope process is the process of formalizing acceptance of the completed project deliverables. Project team performs the assigned activities to complete the project scope and throughout the project, deliverables of the project are completed. Once the deliverables are completed, they must be reviewed by the customer to check whether they meet the agreed requirements in the beginning of the project. A deliverable is accepted and mark as completed only if it is accepted by the customer after checks. 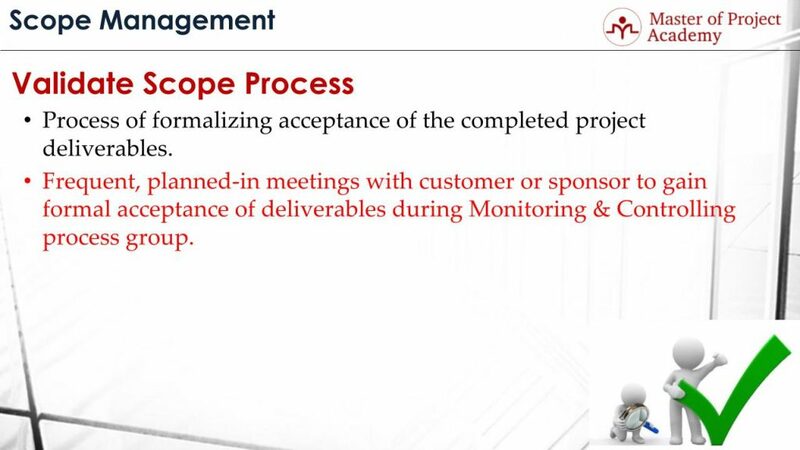 Validate scope process aims to organize frequent, planned meetings with the customer or sponsor to gain formal acceptance of deliverables during Project Monitoring and Control process group. Customer check and acceptance of the deliverables is a critical activity since the final acceptance of the project will be received from the customer. Doing frequent meetings to get customer acceptance is critical because there may be many deliverables in a project. If you wait until the end of the project to get an acceptance and if there are any disputes in the deliverables, it will be hard to do rework and revise the deliverable accordingly. Therefore, deliverables of a project must be shown to the customer frequently and acceptance must be acquired. What Are The Inputs of Validate Scope Process? The first input of the Validate Scope process comes after the completion of the work and it is defined as “validated deliverables”. In order to check whether a deliverable meets the initially agreed requirements, it must have been completed first. After a deliverable is completed, it is controlled in Validate Scope process. 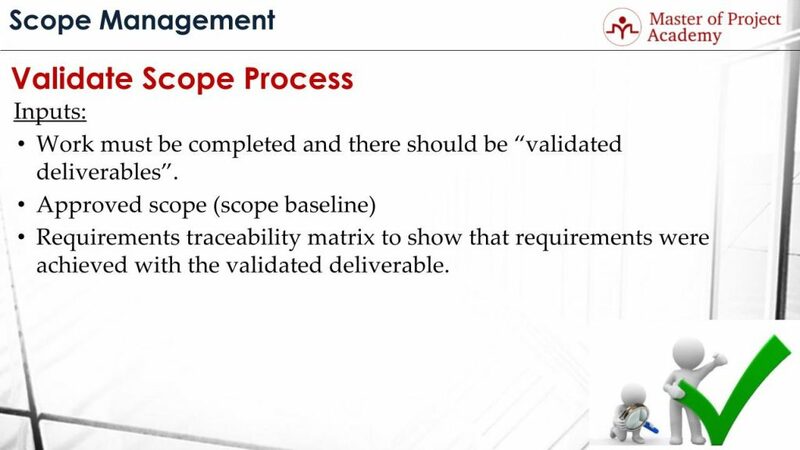 Approved Scope is another input of the Validate Scope process. Scope baseline refers the last scope of a project agreed by all project stakeholders. 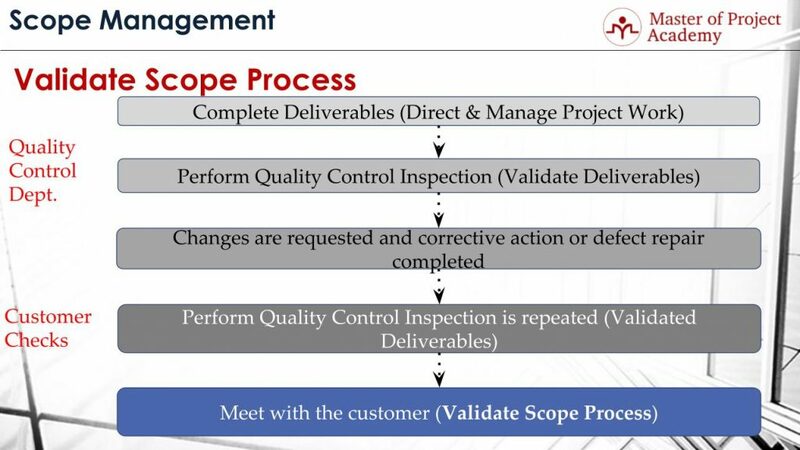 Validate scope process checks whether a deliverable meets its agreed requirements against the approved scope. Requirements, specifications, expectations, performance etc. of a deliverable is defined on the scope, and once the deliverable is ready, they all must be checked. Requirements Traceability Matrix is an input to validate scope process to show that requirements were achieved the validated deliverable. Requirement traceability matrix shows the status of each requirement, the track of requirement, and which deliverable will fulfill the requirement. Therefore, RTM will be an input for Validate scope process. What are the outputs of Validate Scope process? The first output is Accepted deliverables. If the deliverable has been produced as per requirements and the customer approves this, deliverables are accepted by the customer. The second output is the change requests. Deliverables might have met all requirements agreed in the beginning. The customer might come with new requirements since he sees a working deliverable now. These new requirements are initiated with a change request. If change requests are approved by the change control board, then the change request can be implemented by the project team. Another output can be defects. If the deliverables do not meet the agreed requirements, they need to be fixed by the project team, and customer needs to check the deliverable again after the fixes. Project document updates and work performance information are other outputs of the validate scope process. After deliverables are completed and accepted, project documents must be updated and also accepted deliverables must be marked in the project documents. The work performance information about the deliverable must be updated as well. For instance, whether it meet the budget forecast, schedule forecast, quality requirements etc. In What Ways Validate Scope Process Helps? Now, let’s see what are the benefits of Validate Scope Process during the project life cycle. 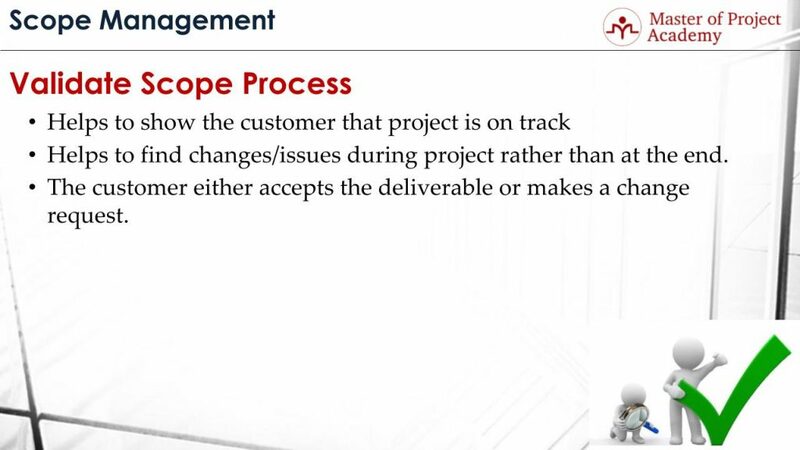 Validate Scope process helps to show the customer that the project is on track. Let’s consider that there will be 100 hundred deliverables in a project and the project duration is 2 years. Even if the customer will be reported about the project progress, as long as the customer won’t be seeing the outputs or deliverables, they might not be 100% confident. However, if these deliverables are presented to the customer and their acceptance is acquired frequently, as soon as new deliverables are ready, the customer will be more confident, reworks will be minimized, and project reporting to the customer will be easier. Validate scope process helps to find changes or issues during project rather than at the end. Since customer will review the deliverables as soon as ready, the project team will be able to fix the issues or problems with the deliverable if there are any, before the project deadline closes. However, if all deliverables are presented to the customer at the end of the project, there might be many issues to correct. So the project team might not deal with all issues in time and this may cause project delays respectively. When a deliverable is presented to the customer, they either accept the deliverable or makes a change request. If the deliverable meets the requirements agreed in project scope, in the beginning, the customer accepts it. Or if there are problems and requirements are not met, defects must be fixed by the project team and the deliverable must be represented to the customer again. And the last case is, even if the deliverable meets the agreed requirements, based on the evaluation of the deliverable, the customer might come with new change requests. For instance, new functionality, new features etc. First deliverables of the project are completed during direct and manage project work process. After the deliverables are ready, Perform Quality Control inspection step takes place. This is done generally by the quality control department of the company. For instance, let’s consider that your project team completed a module of a software in a project. Test department will check before the customer whether the completed module works as per requirements. After the customer checks they can request changes or the defects might be fixed by the project team to meet the requirements. After defects are fixed, deliverable is now ready for the demonstration. Perform Quality Control Inspection is repeated but this time, customer checks the deliverables. After the customer makes his tests, verifications, and validations, project team meets with the customer. If the deliverable meets the requirements and the customer accepts the deliverables. If changes are requested or if there are defects, these are reported to the project team for fixing. Note that, change requests will be evaluated by the change control board and only approved change requests will be implemented in the project.